My Google AdSense earnings are listed near the bottom of this article. 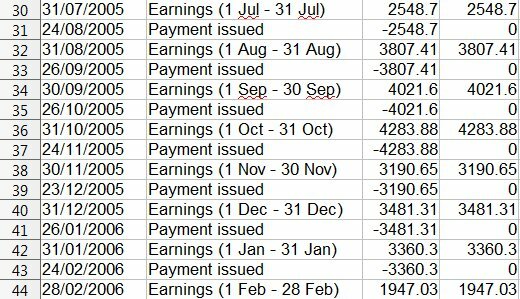 I’d not updated my AdSense earnings since 2011 (updating now in June 2014) and WOW I’ve seen a serious drop in AdSense revenue over the past few years. Peaked in 2010 with annual AdSense income almost $26,000 with a big decline since to just under $8,000 from Google AdSense for 2013! Main problem has been my health problems, had my spine fused early 2009 and though my lower spine is more stable since the operation (which had a long 18+ month recovery period) I’ve developed more health issues that pretty much took me out of action (work wise) for significant parts of 2011, 2012 and 2013. Websites are awesome for making money online with AdSense, but they require maintenance, Google SEO moves on and if you don’t keep your sites up to date they drop in Google rankings and earn less (for example not built new backlinks for years!). Add to this the time I was able to work I’ve tended to put into developing the Stallion Theme culminating in Stallion Responsive (which is awesome for both SEO and AdSense) and it’s not surprising the drop in AdSense income: some of my IMPORTANT sites haven’t had an update in ~5 years! From a me making money online perspective this was/is a HUGE mistake, by late 2013 I’d adapted to some of my health problems and was back to working longer hours and put pretty much all my time into WordPress SEO theme development which makes no money: spent around 6 months researching (getting back up to date with Google SEO wise: Hummingbird SEO is interesting stuff) and creating the code behind Stallion Responsive: you don’t make money researching SEO and coding a premium theme. Stallion Responsive was released in February 2014 and since then (about 3 months) have been building this site even though I know selling premium WordPress themes doesn’t make a lot of money. 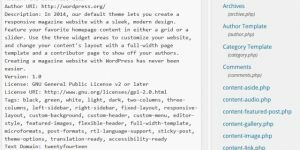 From a making money from websites perspective this again could be another big mistake, the WordPress SEO theme niche isn’t that big (it’s not a high traffic niche**) and competitive SEO wise for obvious reasons. The time spent developing this site I could have been updating older sites that have the potential to make significantly more money. ** According to Google Analytics Keyword Planner the “WordPress SEO Theme” search only generates 320 searches a month! Have adapted my approach with this site over the old Stallion WordPress SEO v7 site, the old site (in the process of moving here) was literately just a Stallion Theme support site (was online just to support theme users with tutorials etc…), this new site is a more general WordPress, SEO, make money online, affiliate marketing type site so will generate more search engine traffic (few months in already does). Would make more sense money wise to stop selling premium themes (easier to develop an SEO ad theme just for MY use) and fully concentrate my time on rebuilding my network of sites. 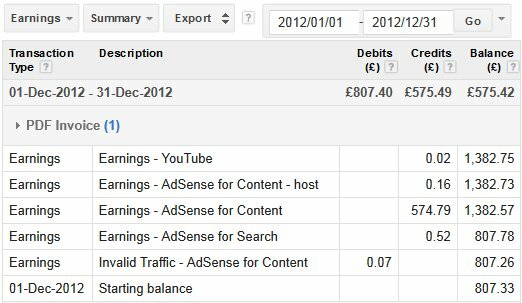 AdSense changed payments to GBP £, using xe.com for conversion (not 100% accurate). 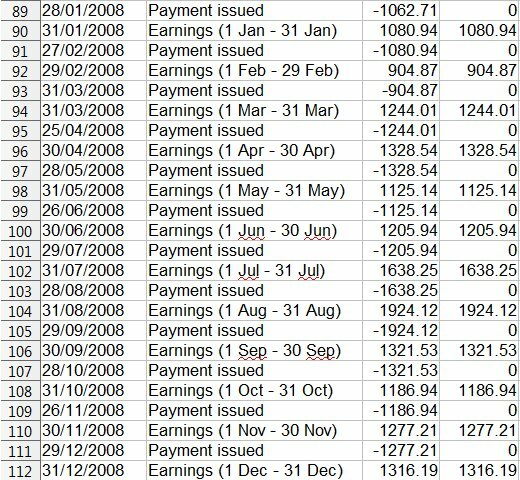 Below is a screenshot of the AdSense report.csv file for older earnings 2004 (when I created an AdSense account) to end of 2007, which pretty much covers my entire time with AdSense. 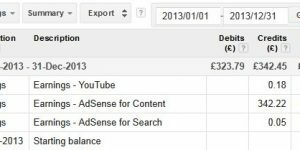 2005 and 2006 was a good AdSense year, I miss the good old days when Google was rubbish at finding and penalizing thin affiliate sites: a lot of that early income was from Amazon thin affiliate stores. BTW If you want to keep an AdSense account for years (had mine 10 years) never click your own AdSense ads, you might get away with it for a few months, even a year, but not for a decade and just look at the tens of thousands of dollars I’d have missed out on had I resorted to and got caught for AdSense fraud. I want to know the name of the website for your Adsense Earnings. I think your numbers look great. And also some proof so that I can start my own site and monetize it with Google Adsense. Hey David, great insight as to how much you can make with AdSense and affiliate marketing. Any tips on how to serve your visitors more relevant ads?